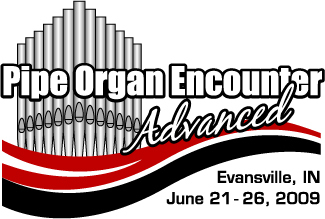 During this International Year of the Organ, the Evansville Chapter and the University of Evansville Student Chapter of the A.G.O. will host the only POE-Advanced in the nation in 2009! The dates will be June 21-June 26. The Pipe Organ Encounter Advanced is a program for high school age organists. We have accepted 18 highly talented organists after a rigorous audition process. Ten faculty members plus an organ builder will also be in residence for the week. (See Faculty Page). Lessons and classes in the art of organ playing and pipe organ building will be given each day. The students will make a field trip to St. Meinrad Archabbey and an evening concert at Salem UCC, Huntingburg by the world-famous organist Daniel Roth. Evening concerts will be given by faculty. They are open to the public and are free (see schedule below). For more information, contact Robert Nicholls, Director at robertn@firstpresevansville.com. 5:30 p.m. Gathering for Welcome meal - Grabill Lounge, lower level of Neu Chapel at the University of Evansville. Meet and welcome POEA faculty and students. 6:00 p.m. Meal - Grabill Lounge, chapter carry-in pot-luck (barbeque and drinks provided). 7:00 p.m. Faculty Recital (progressive) on University of Evansville organs. On the 2001 Casavant organ. of the Dubois County Community Foundation. 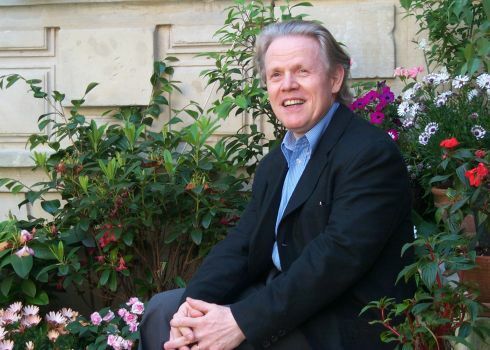 Daniel Roth has been widely acclaimed as one of the leading French organ virtuosos, and has held several prestigious positions as an artist and teacher. At age twenty he made his debut at the organ of the Basilique du Sacré Coeur in Paris, as assistant to his teacher Madame Falcinelli. He later succeeded her as Titular Organist, a post he held until 1985 when he was appointed Titular Organist at St. Sulpice, the famous Paris church where his predecessors were Charles-Marie Widor, Marcel Dupré and Jean-Jacques Grunenwald. From 1974 to 1976 Daniel Roth held the position of Artist-in-Residence of the National Shrine of the Immaculate Conception in Washington DC. Upon his return to France, he resumed his teaching position at the Conservatory of Marseille, which he held until 1979 when he was appointed to the Conservatory of Strasbourg, a post he filled for nine years. From 1988 until summer, 1995, Mr. Roth taught at the Musikhochshule in Saarbrücken. He now is Professor of Organ at the Musikhochschule in Frankfurt am Main, succeeding Edgar Krapp and Helmut Walcha. See more from Daniel Roth's press book. 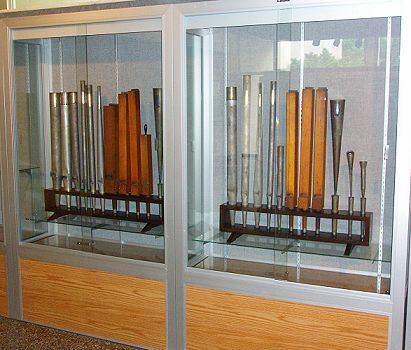 During the POEA, material related to the local art of the pipe organ in its historic and evolving roles will be on display in the lobby of Wheeler Concert Hall on the campus of the University of Evansville. Included is a display of middle-C pipes and a few of the largest and smallest pipes from the Evansville Coliseum Tinker Memorial Organ. Two of the several cases of the middle-C pipes are shown above. We are looking forward to welcoming participants to Evansville for the 2009 POE Advanced. We have a fantastic committee that is working tirelessly to provide an inspiring week of organ events and superb teaching, all in a central location. We have assembled a top-notch faculty, have an informative brochure available, great instruments, and lots of genuine Hoosier Hospitality to offer. Please feel free to contact me with any questions you might have about the POEA. For information on local volunteer needs during the POEA week, please contact Kevin Ellerbusch, Services Coordinator at kme1988@Wowway.com or download the Volunteer Application Form.